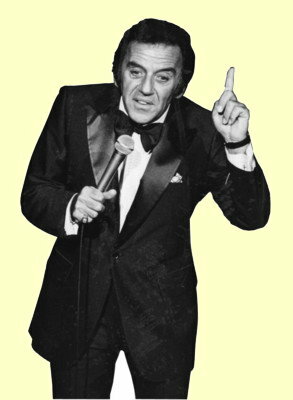 Comedian, Norm Crosby, was born on Sept. 15, 1927, in Boston, Mass. Shown below is a Yiddish guide to this Jewish comedian. Crosby is allergic to horses and dogs. Crosby, in an attempt to freshed up his act, induced laughter through the use of malapropisms. Crosby raised huge sums of money for the City of Hope National Medical Center and Research Institute in Duarte, California. During W.W. II military service, Crosby suffered a permanent partial hearing loss. He wears a hearing aid and often jokes onstage about his inability to hear indistinct speech. He has served as honorary Chairman of the Better Hearing Institute of Washington, D.C.
Crosby perfected his style through years of polishing it in nightclubs, at Catskills resorts, in “kontsert” (concert) halls,, theaters, and on “televisye” (TV). Crosby’s favorite snacks are licorice and corned-beef sandwiches. Crosby was once the advertising manager for a shoe company that had about 40 stores. Norm speaks from his “diagram” and drinks “decapitated” coffee. Crosby has been a guest on The Merv Griffin Show, The Ed Sullivan Show, The Dean Martin Comedy House, and the Tonight Show starring Johnny Carson. He has co-hosted and contributed to The Jerry Lewis MDA telethon. From 1978 to 1983, Crosby hosted the TV series, “The Comedy Shop,” a showcase for stand-up comics. To lend greater credence to his malapropisms, Crosby created a stage persona who seems perpetually bewildered. Crosby toured with Robert Goulet for three years and with Tom Jones for four years. Previous article: "AT THE OLYMPICS, JUST TELL A BRITISH WOMAN SHE'S A TASTY PIECE OF CRUMPET"